Ever since Bush v. Gore in 2000, the issues of voting integrity and voting rights have become of growing concern in American elections. During the last decade, state legislatures passed a series of legal regulations for electoral registration and balloting. The bitter partisan debate has often been framed as a trade-off between the rival values of electoral security (preventing fraud) and voting rights (suppressing participation). Thus, Republicans have sought to tighten integrity through more stringent voter identification requirements; Democrats have aimed to expand convenience registration and balloting facilities. The 2016 elections saw heightened controversy, with Donald Trump’s repeated claims of massive voter fraud, the recount initiative in Wisconsin, Michigan and Pennsylvania supported by Jill Stein and the Clinton campaign, and the FBI reported Russian attempts at hacking of voter registration sites at more than a dozen states, and two successful intrusions in Illinois and Arizona. 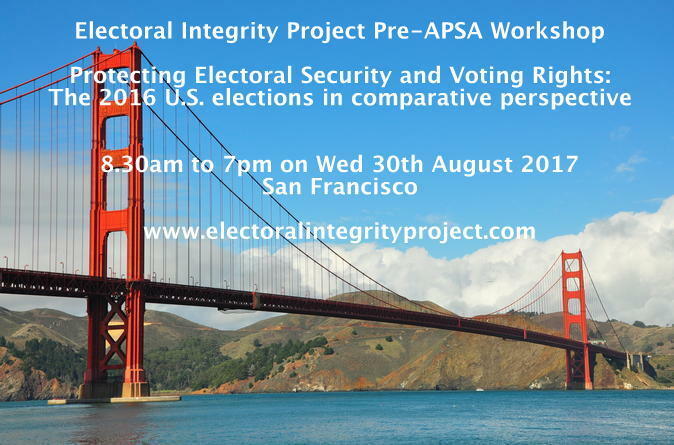 This workshop will present research from scholars and practitioners analyzing the causes, consequences and solutions to problems in electoral security and voting rights during the 2016 United States elections, seeking to understand these issues in comparative perspective. To register, on arrival at the hotel go to the 2nd floor Foyer, outside the Elizabethan rooms. 07.15-09.00 Workshop dinner Zingari Ristoranti, (invitation only), 501 Post Street, San Francisco, CA 94102. Ideally workshop papers should be roughly 8,000-9,000 words in length and delivered to the workshop coordinator in single-spaced PDF format by the deadline of 15 August 2017. The workshop will provide all participants with a buffet breakfast, refreshments, buffet lunch during the event, and an early evening drinks reception. Paper-givers and discussants will be invited to an evening dinner in a local restaurant. Participants can take advantage of APSA annual meeting rates for hotels and travel and you will need to make your own arrangements. There will also be a limited number of hotel and travel awards and priority will be given to graduate students, women, and international participants who are accepted to present papers in the program. Apply when registering and you will be notified of awards granted. If you are granted an award please fill out the following form for reimbursements and provide us with invoices of expenses. All papers will be reviewed for possible publication after the event. Colleagues are also welcome to volunteer their services as chairs and discussants. As well as thematic panels of papers, there will also be special roundtables and interactive break-out workgroups. This event is the 11th in the series of EIP workshops held since 2012, building an international community of scholars and practitioners working on challenges of electoral integrity.